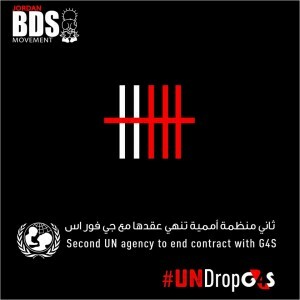 The United Nations Children’s Fund (UNICEF) in Jordan has ended its contract with G4S following a campaign by BDS activists in the country and across the world over the company’s role in Israel’s detention and torture of Palestinian political prisoners and other Israeli human rights violations. “UNICEF did the right thing by ending its contract with G4S as the company supports violations of rights of Palestinian children including their routine torture in Israeli jails. Over the past year, campaigners have been urging the UN and its agencies to end their contracts with G4S over its complicity in Israel’s regime of settler colonialism, occupation and apartheid. G4S provides equipment and services to Israeli prisons, in which thousands of Palestinian political prisoners, children and administrative prisoners, are detained and subjected to inhumane treatment. The firm also provides equipment to checkpoints along the route of the Apartheid wall, the illegal settlements and co-runs the Israeli Police Academy in Jerusalem. G4S has provided services to various UN agencies in Jordan including UNICEF and UNHCR, both of whom no longer have contracts with occupation and apartheid profiteer G4S. UNICEF’s decision comes after a year-long concerted and creative campaign which included meetings, letters, protests and social media actions that called upon the UN and its agencies both locally and internationally to end its contracts with G4S, worth $22 million globally, due to the firm’s complicity in Israeli human rights abuses. Other UN bodies in Jordan including United Nations Development Program (UNDP), World Food Program (WFP), and United Nations Office for Project Services (UNOPS) still have contracts with the firm. Last month, a Jordanian coalition formed to defend the political prisoner, administrative detainee and hunger striker Mohamed Al-Qeeq, demonstrated outside UN offices in Amman. The coalition submitted a statement that was signed by 58 Jordanian organizations, unions and major political parties t demanding the UN to intervene to save the life of Al-Qeeq and as well as to end its contracts with the security firm G4S for its role in the Israeli occupation. A report approved by the UN General Assembly in 2012 by the UN special rapporteur on Palestine, Richard Falk, urged a boycott of G4S over its role in Israeli human rights violations.